The High Protein Peanut Butter Cups I posted about last time were so popular that I decided to create another (possibly even more delicious) variety. In fact, they taste a lot like those icy squares by Moritz that I used to eat as a kid. You know which ones I mean? I used to eat them like they were going out of style. Unfortunately, here are the ingredients: hydrogenated coconut oil, sugar, low fat cocoa, whey powder (milk), soy flour, hazelnut paste, soya lecithin, spice, natural and artificial flavours. Gross. Plus, the packaging says they may contain tree nuts, peanuts, sesame, egg, wheat, and sulphites. So I decided to make my own, which are delicious, but also equally nutritious, made with unprocessed ingredients like avocados, coconut, raw cacao, and raw honey, and without a lick of processed sugar. And, since they are kept in the freezer, they also maintain much more of their nutrient content. Now, I know you must be anxious to whip these up, so I won’t hold you up any longer. Enjoy! In a food processor blend together the avocado, coconut cream, coconut oil, cacao powder, dandy blend, honey, mint and sea salt until smooth. Scoop out the filling and place into the fridge in a sealed glass container to chill for at least an hour. 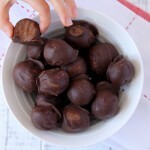 Remove the filling from the fridge and roll into ping-pong sized balls. Place into the freezer in an air-tight glass container. In the meantime, in a small saucepan, melt chocolate chips and coconut oil over low-medium heat, stirring constantly and watching carefully as the chocolate can easily burn. Alternatively you can use a double broiler, but I am too lazy to get it out and pour the water in it. Once chocolate is melted, remove from heat. Line a small baking sheet or plate with parchment paper. 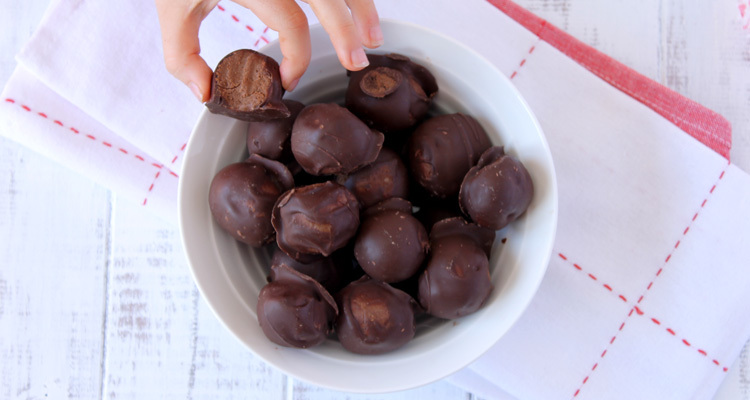 Remove the balls of filling out of the freezer and dip them into melted chocolate one at a time, coating each ball completley, and then place them onto the parchment paper. I used tongs to do this and it worked quite well. Once all the balls are coated, place them into the freezer to set for about 30 minutes. Enjoy them directly out of the freezer.